PART THREE: THE ORIGINS OF CHARLTON-! And STILL MORE Mafia hyperbole. 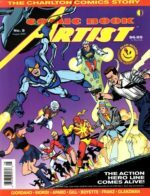 A couple of weeks ago, I began reading, again, my copy of the comics trade magazine, Comic Book Artist # 9, cover dated August of 2000, as well as Roy Thomas’ Alter Ego magazine # 106, cover dated December of 2011, and finally, Comic Book Artist # 12, cover dated March of 2001. All three of these magazine issues are Charlton Comics theme issues. I’m going to put it in my own words here: when Charles Santangelo was young, his father, John, (eventual Co-Founder of Charlton Publications/-Charlton Comics/-Charlton Press, etc,etc — fell in love, with a young woman. Who (of course), he wanted to impress. This gal, who he would later marry, and who eventually would give birth to Charles Santangelo, her son (the interviewee, in that interview) – she had been, in her youth, very, very interested in popular song lyrics, from songs that played on the radio, at that time. John Santangelo had asked the object of his amour, if she would like him to bring back anything for her, on his next trip to New York City, where he, at the time, worked, as a brick layer and a contractor. To that, she replied that she would very much like him to bring back with him, upon his return, the lyrics to many then-popular songs, from the radio. She further had explained to him, that she had often tried to write down the words from the songs, FROM the radio, in shorthand, but that she kept missing certain words. 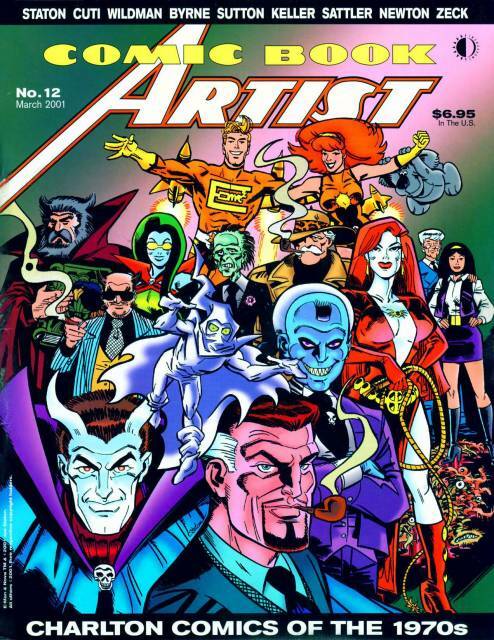 Note: it wasn’t mentioned in the Comic Book Artist # 9 issues what John Santangelo’s wife’s name was. I found that out through internet research of my own. Her name was Carol Prydun. I myself know exactly what she meant by that, because, in my own youth, I’d at times try to write down words from favourite songs I had heard on the radio – long before the existence of the world-wide internet. Like her, I’d always miss some of the words, and come away, frustrated! These days, we can all just look them up on the internet, and get the complete lyrics of anything, pretty-well! Instant Gratification, right? Well, now, yes, but, not back then! This young lady asked John Santangelo if he could bring back with him, from New York City, a magazine containing the lyrics to various popular songs from the radio. Later, in Yonkers, New York, instead, John Santangelo visited every single store he could find, and he finally came to realize – and was also informed – that this type of magazine simply did not, at that time, even exist-! He was, finally able to purchase for her, at least, some sheet music to a few of these songs, but she needed just the words to the songs, not the music notes, since she was not a musician. Finally, she put a piece of paper into a typewriter, and typed out the words, herself, to a dozen songs, on the same paper sheet. Unwilling to leave it at that, and now realizing that no such type of periodical magazine ‘currently’ (at that time), even existed, (that his beloved had requested), John Santangelo suddenly struck upon the germ of an idea! He happened to have a friend, who, like he,himself, was Italian. This friend, in turn, had a relative, who just happened to own a print shop! John S. asked this relative, what would it cost to make him 30 to 50 copies of his girlfriend’s typed sheet, containing those twelve song lyrics from songs, that she had typed out, on her typewriter-? Since no such market for such an item, nor type of magazine, even yet existed, John S. wondered if he could create a market for it, by his having printed up, fodder of this type, for the public….to buy!! He decided to test his idea. The printer informed him that it was going to cost enough money to have him print 20 to 50 copies, that he may as well have 1,000 copies printed up! It turned out that, to print up 1,000 copies, would be a charge of about $20.00 And so, John Santangelo decided to take the risk, and to go for it! Now, twenty dollars was a lot more money – it went a great deal further, than it would, today! I remember, back in the mid 1960’s, that twenty dollars would buy numerous large bags of groceries! And, I remember my father doing that, back in the day! And John Santangelo paid that printer $ 20.00 for 1,000 copies back in 1934. Think how much (even further) that $20.00 would have gone, back then-! For one thing, $20.00 in the 1930’s would have bought 200 (two hundred) ten cent comic books, at the time! Once John S. received his print run of 1,000 copies (with ten cents a copy, printed at the top of each sheet of twelve full song lyrics, the couple drove all over town with them, and they talked each store they entered, in to accepting, for sale, 20 to 30 copies, at each store, for ten cents per copy-! Now, you could buy a 68 page (or more) comic book, back then, for that dime!! These single pieces of paper were selling, for a dime, each! The agreement that John S. verbally described to each store owner that they visited, was that these stores were to all try to sell these, with no money being advanced to John Santangelo, up front. John S. would be back to each store, to check on progress on this matter, within about two weeks. These song sheets were actually delivered to stores over much of Connecticut, in fact. At each and every store, when John S. returned, two weeks later, the store owners all kept telling him much the same story: that all the song sheets had, in fact, SOLD OUT, in two days! And so, John Santangelo. kept doubling the amount of sheets he dropped off to every store he re-visited, selling, continually, more and more copies, continually giving the stores more copies, each trip, than had been given out, on previous trips, to the stores. Nonetheless, the music lyric sheets still kept selling out! John Santangelo had created a market niche for a new product, so to speak! It was kind of like that old story, wherein, on the first day, someone pays you a penny, and on each consecutive day, they double the amount they paid you on the previous day; and so on and on, ad infinitum! John Santangelo was actually getting RICH, with this business scheme! This all occurred some time in the year 1934, during The Great Depression. There was just one problem; a problem that John S. was completely, blissfully, innocently, unaware of. John Santangelo was an immigrant to the United States. Therefore, he had absolutely no clue, whatsoever, that what he was doing was….highly illegal-! That he was, profiting from other people’s, legally copyrighted work! Within a short amount of time, ASCAP, the acronym of which stands for the American Society of Composers, Authors and Publishers, was after him, legally! In The United States, (as in my own country, Canada, mere ignorance of the law – any and all laws) – is NOT an acceptable legal defense, for breaking any law(s.) If that were true, then most arrested people, would, and could, very likely plead that they had been unaware that there WERE such laws, regarding any crime that they were charged with! But given the circumstances, I am, nonetheless, sympathetic, regarding the sentence John Santangelo was forced to serve. 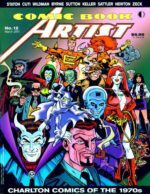 John Santangelo ended up being arrested for copyright infringement, and for profiting, from others’ works. He received a jail sentence of a year, plus a day, in The New Haven County Jail! Sounds to me, like a pretty harsh sentence in prison, for an innocently-meant business venture! But hey, a slap on the wrist, based on J. Santangelo’s complete ignorance of the law, would have likely done nothing to deter others from committing the same, or similar, offenses! And, of course, these laws do exist, for a reason. Now, then: what is a similar – sounding word to ‘profitting’? The word that comes to mind, (for me), is ‘profitteering.’ And, this second word reminds me (and likely, others), of the word….MAFIA-! But, then again, some people who add up two and two….come up with six! And, while always far from being a good mathematician, even I, could add two and two, and come up with…four! 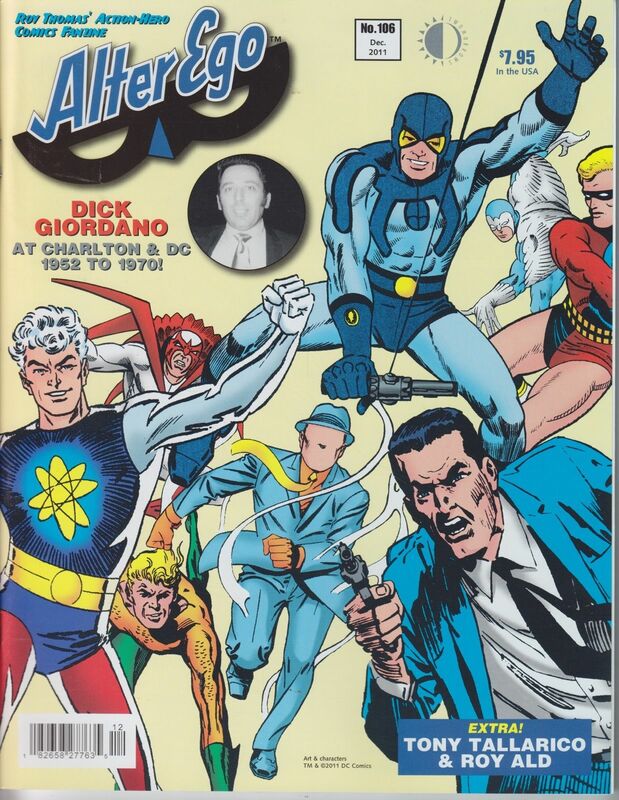 But NO — there is MORE to my theory of HOW, in my opinion, the MYTH of why people probably, perhaps quite innocently, perpetuated the story that John Santangelo’s future companies, including Charlton Publications – later Charlton Press – (which ALSO included, but was not limited to The Capital Distribution Company, and Charlton Comics), had links to the Mafia! (Others have said Charlton didn’t merely have ‘links to the Mafia’, but that, indeed, that Charlton was a Mafia-run business-! While judges do have some legal leniency rights – which is to say, the legal right to excercise some discretion, in terms of how harsh a prison sentence they can imposed, (as in the case of John Santangelo), for particular crimes, (governed, of course, by particular state legal statutes), including in situations like this — they also, legally, have the legal right to excercise the law, to its’ fullest degree possible, for any particular law statute. The legal right, as judges, to apply the full length of time penalty, in prison, as applies to each particular type of crime. 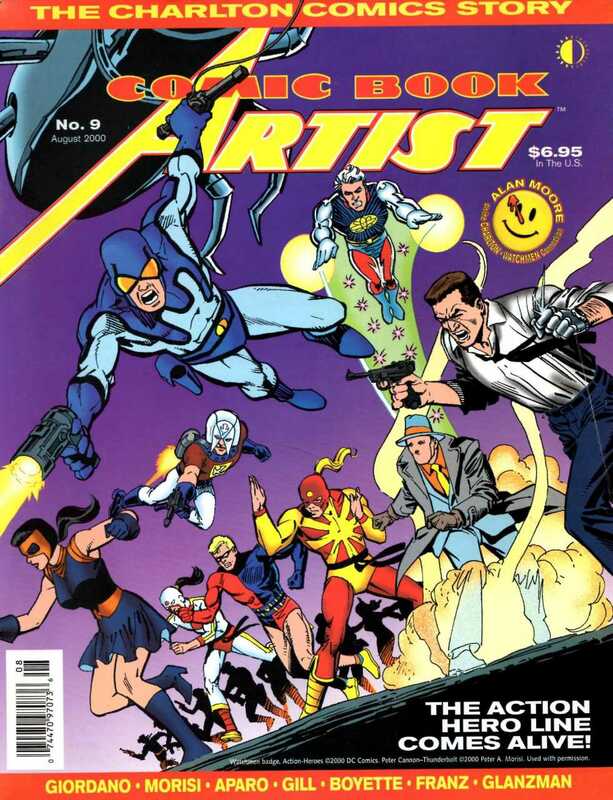 Christopher Irving conducted an excellent interview with his subject, Charles Santangelo, the son of the above, John Santangelo, in the trade magazine Comic Book Artist # 9. 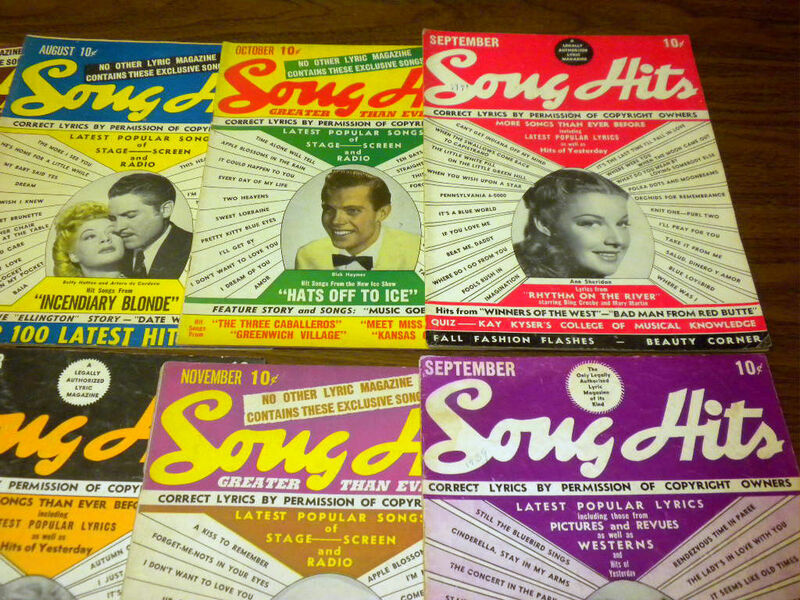 Charles Santangelo, son of John Santangelo, was born in 1935, only one year after his father began copying those song lyrics sheets, and distributing them to stores in Connecticut, for sale, at a dime each! In prison, John Santangelo and Ed Levy (an imprisoned lawyer), hit it off, and became fast friends. John Santangelo explained to Ed Levy, while they were both still in prison, that, since they were both due to be released from prison at around the same time, if his new friend, Ed Levy, could find a way – as an attorney – to legally lease the printing/-publication rights, to numerous popular song lyrics, in magazine form, then John Santangelo, in turn, upon their release, would make Ed Levy his business partener, in this venture! Upon release from prison, Ed Levy DID legally obtain/-procure those magazine printing rights, for an agreed-upon sum of money, by Mr. Levy visiting the music publishers in New York, in order to pay royalties. In order to (now, legally), publish numerous song(s) lyrics, in magazine form! Their first magazine of this type was entitled HIT PARADER. Initially, they were having the magazines printed/-published by an independant, New York-based company, for the first five years, following their stints in prison. 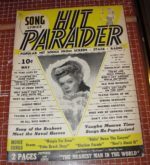 Hit Parader started being published in 1937. Later, they debuted a second long-running title, entitled Song Hits. 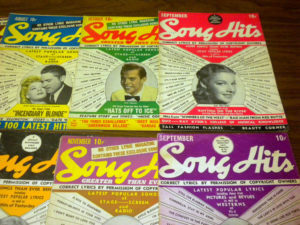 I checked ebay, and there, I found numerous early issues of these song title magazine. The earliest edition of these magazine I found there, being offered for sale, currently, dated from 1941. Additionally, I did some online research on this title on other websites, myself. Around 1947 or 1948, these two new business partners purchased several printing presses. They then began hiring and training people to run these presses, for them, who had worked on these types of presses, before! This all happened in the small town of Derby, Connecticut. For several years, John Santangelo and several other employees of his, distributed various magazine titles, themselves, by distributing them to numerous stores, in their cars! 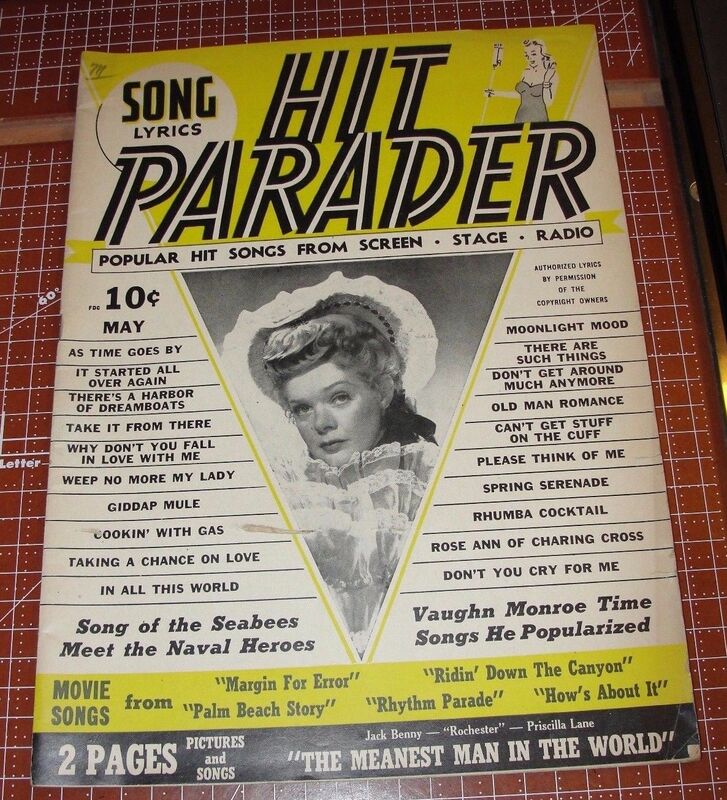 While Hit Parader was the very first magazine of this type, Song Hits was Charlton Publishing’s second title. Eventually, they bought out a competitor, which had previously put out a magazine, which had ‘aped’ Hit Parader; they then began publishing that one, as well! The name Charlton Publishing originally came from the fact that the son of Charles Santangelo, as well as Ed Levy’s small child, were both named Charles! Other song lyrics titles eventually followed, as well, including, but not limited to, Country Song Round Up, Rhythm And Blues, Rock And Soul, Popular Songs, and even one titled Songs That Will Live Forever. As mentioned previously, early on, Charlton Publishing was having a different company, out of New York, (not one affiliated with them), publish their magazine periodicals. But once Charlton Publishing began publishing their OWN magazines, with their OWN printing presses, that they had, themselves, financially procured, they changed their company name, from Charlton Publishing, to Charlton Press. 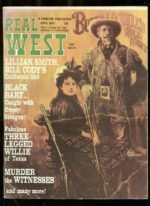 Other types of genre magazines followed, including humour magazines, and even a magazine about true stories of the 1800’s cowboy days, which was titled True West. 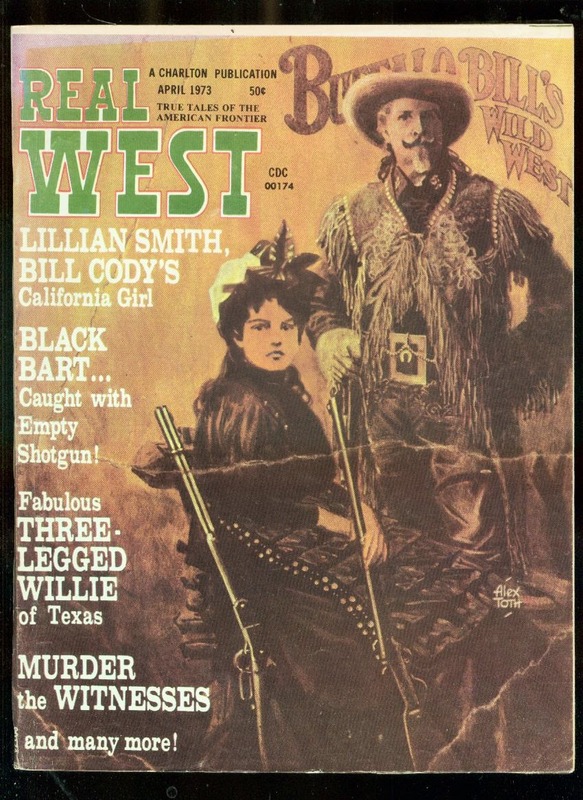 Note: the Real West Charlton magazine cover attached here, was painted by the one and only highly collected artist, Alex Toth! While Hit Parader magazine began to be published in 1937, (originally from Charlton Publishing), and, as mentioned, originally published by an independant publisher in New York, on behalf of Charlton, Charlton Press’s very first comic book title did not come out until late 1945, dated inside as November of 1945. World War Two had only just ended on September the second of 1945, just a few months before the publication of this mostly ‘funny animals’ type comics title. 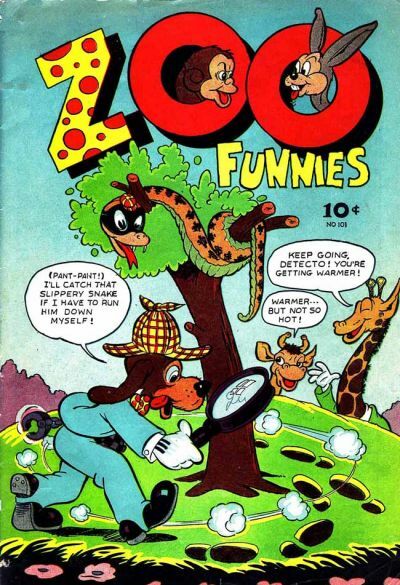 This very first Charlton comic book was entitled ‘Zoo Funnies’, volume one, number one. The reason I specify this title as VOLUME ONE, was because there would eventually be three separate and distinct series Charlton Press’/- Charlton Comics’ titles of ‘Zoo Funnies, although series three of ‘Zoo Funnies’ spawned but a single issue. Zoo Funnies, Volume One, Number One’s importance in comics history is (NOT) just because it was the very first ever, Charlton comic book – which it was! While it is (NOT) noted inside Bob Overstreet’s annual comics’ values book, entitled THE COMIC BOOK PRICE GUIDE, Zoo Funnies, Volume One, Number One, is important to comics history, for still another (and mostly unknown), SECOND reason. 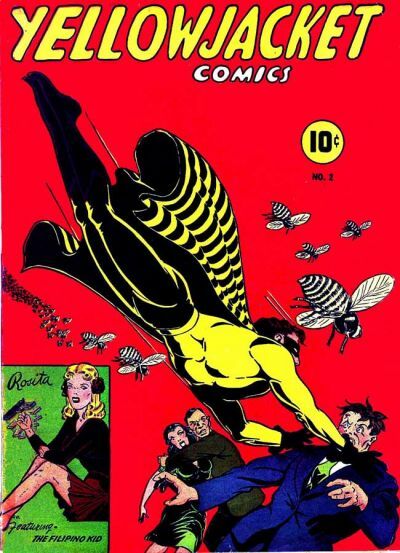 And that reason, is this: while Charlton Comics’ very first superhero was Yellowjacket; he appeared in the title ‘Yellowjacket Comics’ for ten issues – and his NEPHEW, who also had the SAME POWERS as he, appeared in his own solo adventure, in Zoo Funnies, Volume One, Number One, November, 1945. And that, right there, is the second reason – in my opinion – why Zoo Funnies, Volume One, Nov., 1945, should be considered an important Charlton Comics’ KEY issue! Charlton’s Yellowjacket, himself (for those who do collect this Golden Age, mid-1940’s title, like myself, should be aware that Yellowjacket also appeared in two other comic book titles, aside from his OWN title. But, we’ll get to that, shortly, in upcoming chapters of THE CHARLTON MYSTIQUE! 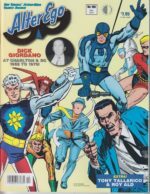 Continue to The Charlton Comic Mystique part four: A CAPITAL IDEA! THE ONE – STOP PUBLISHING SHOP IS HERE!